"I’m in the mood for some sea air," Bruce sighed. "It’s fresh and brisk and brings color to our wings." "Ah, the smell of fish, seaweed and salt water. What more could a butterfly ask for?" Bonnie chided. "Bonnie, you’re being smart, aren’t you? There’s a wee village on the coast, not too far from here. It’s called Newhaven. There’s a lighthouse on a wall guarding the harbor. We could sit on top of it and watch the boats come and go," Bruce suggested. "Yes, but when the fishing boats come in, so do the seagulls," Bonnie reminded. "Come on, Bonnie; just for a little while, please?" Bruce begged. "All right. Newhaven it is." The two butterflies headed towards the Firth of Forth. "There aren’t any flowers down there, you know that, don’t you?" Bonnie said. "Yes, but just think of how delicious those strawberry blossoms will taste after we’ve filled our lungs with fresh sea air!" "Strawberries? Did you say strawberries? I love strawberries," Bonnie said, her mouth watering. 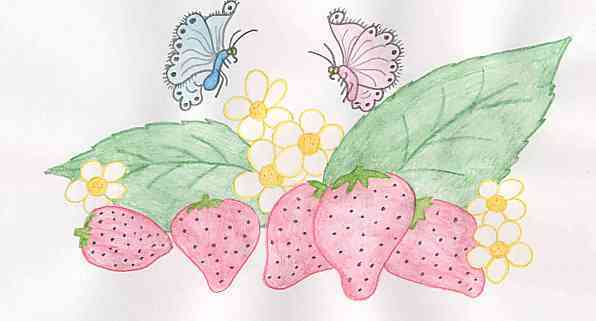 "I happen to know that one of the houses down at the harbor has a fabulous back garden filled with strawberry plants. We’ll flutter over there are have something to eat after we go to the lighthouse," Bruce teased. "Newhaven, here we come!" Bonnie said. Her wings flapped up and down as fast as she could go. "Slow down," Bruce huffed and puffed, but Bonnie flew as fast as her wings would take her. "There’s the lighthouse now," Bonnie said. She swirled in a big circle, high in the air, and landed on the white lighthouse. "This is quite nice here," she said, looking around. "There’s a church, a fish and chips shop and a lot of old buildings." "Newhaven has quite the history," Bruce said. "And I suppose you just have to share it with me. Am I right?" Bonnie asked. "Well, it is rather interesting. If you’ll look around and try to picture things as I tell you about them, you’ll enjoy it," Bruce assured. "Let’s get it over with. Go on," Bonnie sighed. "This used to be just a tiny village until King James IV decided to use Newhaven as a royal dockyard way back in the 1500’s. People came from all over the country and from Europe, especially from Flanders, to help work on the ships. There was a famous ship, the Great Michael, that was built right here; right near where we stand. Isn’t that amazing? Can’t you just imagine the ship being built?" Bruce said, excitedly. "It took six years to build. Think of the hammering and all the wood being brought here and cannons too. It must have been an exciting time in Newhaven." "I suppose it must have been," Bonnie said, trying to be interested. "After a while though, it settled down into a small fishing village again. It was a great place to get oysters. Most of the men here went out each day to fish. When they brought their fish back, their wives would take the best of the catch and walk the streets selling the herring and cod. They were called ‘fisherwives’ and they dressed in interesting costumes. But, sadly, a lot of the men died in storms." "You’re right, Bruce. I can imagine the ‘fisherwives’ walking the streets selling their catch. This must have been a wonderful place to live. It’s not like that now though, is it?" Bonnie asked. "Look around you. Things change with time. Sadly this is no longer a fishing village, but just a part of the big city of Edinburgh," Bruce explained. "Here comes a small boat!" Bonnie said. It chugged its way through the harbor walls. "And here comes the seagulls. Time to leave." The butterflies fluttered away towards Main Street. "Where’s that strawberry patch?" "Over here," Bruce said. "Follow me." They fluttered into a back garden. It was filled with blossoming strawberries. "Oh my. Those look delicious. Look at the tiny white flowers with yellow centers," Bonnie said. Her proboscis sank into them. "Mmmmm." Bruce joined her. "Newhaven strawberries are tasty. King James IV used to come down here to check on his ships and when he did, the Newhaveners would bring him baskets of strawberries. I can see why he liked them. These petals are delicious!" "This has been a nice day," Bonnie said a while later. We got plenty of sea air, saw the lighthouse and harbor, learned a little bit of history and had some strawberry blossoms. I like Newhaven! We’ll have to come back here again!" "We will, but for now, we’d better get out of here. More boats are coming in with their catch and that means more seagulls," Bruce warned. "I thought it wasn’t a fishing village any more. Why are their boats catching fish?" Bonnie asked. "There’s a huge fish restaurant nearby and the locals provide them with fresh fish. That’s about it," Bruce said. SQUAWK! SQUAWK! SQUAWK! The sky filled with seagulls. Bruce and Bonnie flew away from the coast, heading for safer ground. They’d had a splendid time in Newhaven. See maps of Newhaven here!